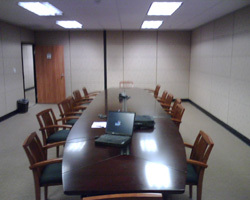 For a first class professional environment coupled with convenience, we offer the TO&A Corona Court Reporters Suite. With a choice of fully furnished conference/deposition rooms, you can be assured of a smooth court reporting process and our cutting edge technology makes depositions a breeze. TO&A experienced administrative, technical and deposition support staff are dedicated to making your job easier.